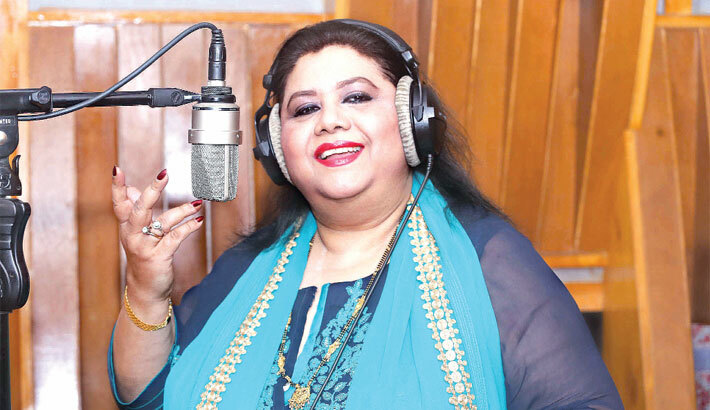 Internationally acclaimed Bangladeshi singer Runa Laila has lent her voice in a new song recently after a long hiatus. Written by prominent lyricist Kabir Bakul, London’s music arranger Raja Kaasheff has been arranged the music of the song. The song titled ‘Ferate Parini Aar Tomake A Bhalobasay’ has been recorded at the studio of Chirkutt in the capital’s Niketan area on February 14. The song will be released under the banner of Dhruba Music Station very soon. Runa Laila was very emotional while rendering her voice in the song after a long hiatus. And another reason for being that Runa Laila sang a song her own melody for the first time. It is mentionable that, a music video of the song will also be made very soon. Runa Laila is a Bangladeshi playback singer, widely regarded as one of the most popular singers in South Asia. She started her career in Pakistan film industry in late 1960s. Her style of singing is inspired by Pakistani playback singer Ahmed Rushdi and she also made a pair with him after replacing another singer Mala. Her playback singing in films – “Jadur Banshi”, “Accident”, “Ontore Ontore”, “Tumi Ashbe Bole” and “Priya Tumi Shukhi Hou” - earned her six Bangladesh National Film Awards for Best Female Playback Singer. In recognition of her contributions, Runa Laila was honoured with Radio Mirchi Music Award presented by Radio Mirchi at Nazrul Mancha in Kolkata in 2015, Independence Day Award of Bangladesh, Bangladesh National Film Award for Best Female Playback Singer in 1976, 1977, 1989, 1992, 2012 a and 2015, Shelteck Award, Lux Channel i Lifetime Performance Award, Saigal Award, India, Nigar Award, Pakistan (twice)1968 and 1970, Critics Award, Pakistan, Graduate Award, Pakistan (twice), and National Council of Music Award- Gold Medal, Pakistan.